Title text: I mean, if it's that easy to get a theorem named for you ... "a straight line that passes through the center of a coplanar circle always divides the circle into two equal halves." Can I have that one? Wait, can I auction off the naming rights? It can be the Red Bull Theorem or the Quicken Loans Theorem, depending who wants it more. But if we didn't use fancy-shmancy names for things, anybody could understand math, and then where would we be? The point of having such theorems of “blindingly obvious” concepts is to provide rigorous proofs of concepts that we understand intuitively—our subconscious makes the leap directly from A to D without bothering with noticing B and C as necessary intermediate steps. Well yeah, the theorem looks obvious on a graph like that. But I think the reason it actually gets Rolle's name is not that he was the first to notice it, but that he made the concept rigorous ... imagine a differentiable function you can't easily visualize. Or maybe a function in more than 2 dimensions. It's nice to know ahead of time that there must be maxima and minima for some values of the independent variable. I laughed at his example of a new geometry theorem though. Mostly about selling the naming rights. Didn't some guy actually do that with an asteroid? It was like several years ago on eBay. The IAU wasn't happy, but as long as their naming conventions were met there wasn't much they could do. Heimhenge wrote: The IAU wasn't happy, but as long as their naming conventions were met there wasn't much they could do. Sure there was. They're not a court of law; they have no inherent obligation to behave in a consistent manner regardless of outcome. There's nothing stopping them except laziness and conceptual blinders from dealing with situations on a case-by-case basis. Yeah, the point about the theorem is not the result, but the proof of it. I like to tell people that when I studied maths at a prestigious university, it took 4 weeks to get to the proof that 2+2=4. It's not that the proof itself is terribly difficult, but that it starts from ZF axioms, and the conceptual groundwork had to be laid for those first. Interesting to see that Rolle didn't even belive in differential calculus when he proved this. This takes me back to 9th grade Geometry. I was definitely the kid saying "I knew that when I was 6. What's the point of proving it?" Now I get the point about hard proofs of simple things, but I wish it could have been explained back then. Instead, I came out thinking "I love math, but hate proofs". That didn't serve me well when I needed to prove harder things in college. I'll pay $100 to have that theorem named after me. And $5000 if you don't tell anyone that I got it by paying for it. Velo Steve wrote: This takes me back to 9th grade Geometry. I was definitely the kid saying "I knew that when I was 6. What's the point of proving it?" That was me with matrix multiplication. "But why do matrices multiply like that? Who says? It's stupid"
is Rolle's first name "Rockand" ? No, I believe it was Howie. Sounds like something good to use on a cop sometime. "Officer, I Rolle'd up to the stop sign. Because I was on a hill I Rolle'd back. Therefore, by Rolle's Theorem, I stopped at least twice." rmsgrey wrote: I like to tell people that when I studied maths at a prestigious university, it took 4 weeks to get to the proof that 2+2=4. It's not that the proof itself is terribly difficult, but that it starts from ZF axioms, and the conceptual groundwork had to be laid for those first. We didn't get that far until year four of the course. Magic is real, unless declared integer. A very important function of this sort of proof of things that are "obvious" is not so much to verify the property being proved so much as to verify that the abstract system of math that we're trying to formulate leads to the desired properties that we have intuitive ideas about. Put another way, is the abstract, rigorous math system that we call "calculus" the correct abstract, rigorous math system relevant to the real world, or are we accidentally describing something else entirely? These obvious properties are a good deal less obvious when you consider that the definitions for things like "real numbers" and "continuous" are based on the behavior of sequences of numbers. For instance, a function is said to be "continuous" if for any sequence of numbers that converges toward a limit, the corresponding sequence of numbers after the function has been applied will also converge toward some limit. But we're claiming that this definition somehow leads to behavior intuitively described by a squiggle drawn on a whiteboard! There's nothing obvious about that at all! Last edited by keldor on Wed Sep 05, 2018 9:45 pm UTC, edited 2 times in total. Do you mean two years after the second year of the course? Ken_g6 wrote: "Officer, I Rolle'd up to the stop sign. Because I was on a hill I Rolle'd back. Therefore, by Rolle's Theorem, I stopped at least twice." However simple and pure the hill curve is, the derivative y'=g(x') - distance for attained for each velocity - derived from the y=f(x) - the height of the slope at any given distance (horizontal or slope-hugging, to taste) is discontinuous and not even like a tangent's vertical asymptote to infinity but a distinct up-to-but-not-including limit. And I'm still not quite sure what the proper mathematical description for such a discontinuity would be. Except that there'd be various output (distance reached) values that are undefined for given inputs (initial speed), and likewise certain initial speeds that remain undefined as the solution to the inverse solution applied to given distances reached. It doesn't even rightfully go to imaginary values (maybe they appear in the integration/differentiation, but given discontinuousnesses there are already other issues needing to be resolved). But every time I played crazy golf I was always very thankful of rolling friction. If not windmills. ... And I'm still not quite sure what the proper mathematical description for such a discontinuity would be. Except that there'd be various output (distance reached) values that are undefined for given inputs (initial speed), and likewise certain initial speeds that remain undefined as the solution to the inverse solution applied to given distances reached. It doesn't even rightfully go to imaginary values (maybe they appear in the integration/differentiation, but given discontinuousnesses there are already other issues needing to be resolved). That a great puzzle. Just had to say that, if I understand your posed undulating hill scenario, I suspect for whatever output you observe, there's probably more than one input that would map to it. If you just provide the ball the negative of its exit velocity at the exit point, it would trace back only a single trajectory, sure. But my intuition says you could get that same output with other inputs simply because of the number of degrees of freedom. I just don't have the balls to prove it. In the absence of friction, a given initial kinetic energy converts to a given maximum potential energy, and a given position has a given potential energy, so a different starting speed must produce a different highest point. Different initial velocities with the same speed may or may not come to the same point, but will come to the same contour (possibly a disconnected component of the same one). You mixed up your YouTube link. This is Richard Rolle. Yours is Richard Astley. From all the star-sown sky. And still the sea is salt." My favorite of these is the Maclaurin series. Maclaurin took the already existing Taylor series, set a = 0, and got a whole other series named after him. Once a relationship ends, physical access to all relevant machinery is denied. To add to that, consider a simplified model where the ball is attached to the hill, maybe it's really a toy train sliding on a rail or something. The maximum height will be proportional to the square root of the velocity, so graphing the velocity against the maximum height will give a sideways parabola. Graphing the velocity against the maximum distance simply requires taking a particular inverse of f(x) at the corresponding height - namely, the first x that maps to that height. The fact that not all distances are a maximum distance corresponds to the fact that f is not injective; the fact that not all velocities map to a particular maximum distance corresponds to the fact that f is not surjective. How could you get to year four without proving that? Did you start by proving 1+2 = 3 in your third year? A far more egregious example of this is DeMorgan's Laws. Not only are these obvious, they are trivial to prove and have been known forever. It's like naming the exponent property (ab)c = abc "Eebster's Law." As far as his complaint, I'd guess that's a mathematical case of "Hamlet is Cliched". Am I a clueless art person if I look at the "Orange, Red, Yellow" painting and genuinely believe my kid could make that? What about the Gas Laws? They relate pressure, temperature and volume of an ideal gas. I'm pretty sure that any one is a corollary of the other two, so one of Boyle, Charles or Gay-Lussac was freeloading. Mental Mouse wrote: As far as his complaint, I'd guess that's a mathematical case of "Hamlet is Cliched". I'd say a better comparison would be Plutarch's lives; people did stuff, Plutarch wrote it down (or copied other people's writing it down), and Plutarch became known for the stories. Looking at the history on the Wikipedia page, Rolle's Theorem was developed shortly after the formal mathematical language to state it became common, and isomorphs were developed centuries earlier. I think this theorem might be like identity property: nobody was surprised by it, but it's useful sometimes for it to have a name. Last edited by Quizatzhaderac on Wed Dec 26, 2018 8:43 pm UTC, edited 1 time in total. Hi guys, whats your opinion on his theorem? I sadly don't remeber the specifics at this moment, but im pretty sure we covered something like this in my geometry university course. The general idea was, that you can't divide the area of a circle in two identical halves by dividing it with one straigth line, without using some points not at all ( or two times, for that matter, but i'm quiete sure that wasn't in his mind). Specifically, if you think about the center point: either you use it twice, none at all or your halves arent identical. @maniexx wrote: Interesting to see that Rolle didn't even belive in differential calculus when he proved this. And he didn't even prove it. Cauchy proved it more than a century later. bobleboffon3 wrote: Am I a clueless art person if I look at the "Orange, Red, Yellow" painting and genuinely believe my kid could make that? Well, you're at least uninitiated, but no fault in that. The thing is, Western art, especially in the last few centuries of travel and communication, has been in part an ongoing conversation among the "big names". Nowadays, that conversation has gotten large enough to break into multiple conversational circles (see also: fandom), but it can still be traced from something like the 16th century through the 20th and (in parts) 21st. Some of the odder things in Modern art, such as canvases painted in solid colors, are basically jokes or challenges in that conversation. For example, in some cases the painting-as-artifact was itself significant in the light of prior works. It there's someone here who's actually been trained in this stuff, feel free to expand, I'm mostly a bystander. orthogon wrote: What about the Gas Laws? They relate pressure, temperature and volume of an ideal gas. I'm pretty sure that any one is a corollary of the other two, so one of Boyle, Charles or Gay-Lussac was freeloading. When Boyle was working in the very infancy of chemistry, there was no rigid concept of temperature. And proving that a relation is linear is another story than having something as a constant. My point is that you can derive Gay-Lussac from the other two by (conceptually) changing the temperature at constant pressure (Charles's Law) and then compressing back to the original volume at constant temperature (Boyle). Gay Lussac's Law drops out in 3 lines of algebra. orthogon wrote: That was me with matrix multiplication. "But why do matrices multiply like that? Who says? It's stupid"
We started straight off with the applications, so it never seemed stupid. Not easy, but it was clear that there was a point to it all. I wish more schools did that. We spent multiple weeks on matrices in pre-calculus and I don't think we once covered a single application. I was perhaps 12 or 13 when introduced to matrices. I don't think I was given a practical application for them until I was in Uni (beyond even A-Levels, which might have used them in the Pure Maths component but obviously without obvious real-world application) and I'm only even guessing at that, I think I didn't go into the kind of physics that needed them specifically, and coding Structs or similar weren't particularly sophisticated at the time so nobody said "Hey, let's code something to handle matrix-like data structures, just for fun", when almost everything was more likely to be function-orientated than OO, anyway. The only Real World application I can currently identify as "matrices are 'useful' in this context" is 3D graphical transforms/rendering, and yet I still find myself happier to just do it all manually in an "x=(this*sin(theta))+(that*cos(theta)*sin(phi))+(other*…); y=…" sort of way after a little mental juggling and (if necessary) a quick prototype module¹ to confirm I'm not introducing a sheer transform by accident. I've forgotten most of what I used to (to a decent level) know about matrices, though, so that's just me being lazy about relearning them. I was introduced to matrices at age 15, purely as abstract numerical concepts. I thought they were great. But then, I've always found maths involving the real world a little dull. Rolle's Theorem certainly proves soemthing that seems obvious. Where its importance lies is that, once it's been proved rigourously, it can then be used in other proofs. E.g. Cauchy's mean value theorem. That Cauchy also proved. And this proof is used all over in real analysis. (Second year Maths course, using Spivak as the text). I found complex analysis much more fun. The whole thing about naming mathematical theorems is not about who thought of what, how obvious it is, or how useful the proof is. It's all about whose name will be quoted in future work. Somebody (Drobisch and Bellavitis, in this case) decided to use a given name, because he thought it'd be easier to describe his own idea if he just states the given fact as "This person's theorem" (because that's less frowned upon than saying "it's obvious"). And the name stuck. So Randall just has to pay several people to start citing something as "Munroe's theorem". Maybe high-profile professors, so that there's a higher chance for adoption. P.S. 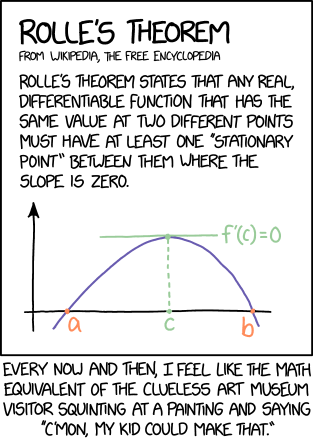 The interesting stuff about Rolle's theorem is actually in what set of functions is it correct. Rolle proved it for only one limited set of functions, but people are still trying to find points with zero in the subdifferential between two points with equal values for all sorts of other functions. It was a general maths course, so much of the previous years involved mechanics, statistics, pure maths, etc. It wasn't until year four when we could take a course about deriving arithmetic from ZF axioms. 2. Do you like it? Does it move you in any way? Ideally the same piece of art will have the same emotional reaction no matter where it comes from. I love that piece, when I look at it it makes me feel something. I don't know much about the background of it, I just love it.